Observation - Caddisfly larva - UK and Ireland. Description: Cased caddisfly larva, around 20mm long. Very active. Case, tatty, made of rolled leaves, twigs, very small stones etc. Found in fast running stream on limestone, but with high level of tannin discolouration. 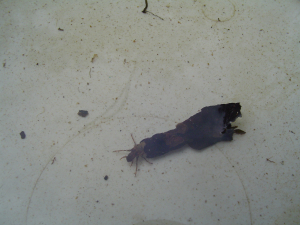 Cased caddisfly larva, around 20mm long. Very active. Case, tatty, made of rolled leaves, twigs, very small stones etc. Found in fast running stream on limestone, but with high level of tannin discolouration.